Successful reporting in your contact center is something that helps you improve productivity, increase revenue, manage agent performance and adherence and reduce or eliminate the daily challenges. However, for most managers, part of the challenge is having the combined consolidated information that keeps you alert and aware of the contact center status. Spectrum has been providing Call Center Reporting for over 20 years and has learned from customers the top recommendations to successful reporting. As most already know there is a lot of data to sort through and there are a lot of call center applications to review. So trying to get to the center of the problems is not always easy to do. Define your problems as clearly and concise as possible. Stating something general or too board reduces the value of the reporting. What managers should do is define the problem and the results of that problem. Define where you have the most to gain. By reducing the problem or solving it define what the results will be to the contact center and the business. Have reporting that is visible and will alert the right people at the right time. Manage the change in the Contact Center problems. Challenges change so modify your reporting to follow the change. Good or Bad. Combine and consolidate the data. What are your goals for the Call Center and be very specific and detailed not general. Select the most beneficial goal to the business or call center. Think about this from Senior Management point of view. Define your problems as clearly and concise and include as many details as possible. Stating something such as Agents are not meeting their adherence schedules is too board of a statement. State the group, the communications channel, the days of the week and times of the day. Check the agents call transfers, aux code times, abandon rates, etc. There are many problems in the typical call center day, by detailing the problem, resolutions can be found. Are the challenges hard to find because they are always moving? As an example, a mutual fund company had an issue with abandonment rates in one of their groups - existing customer Fund Transfers. The abandon rates seem to increase Tuesdays through Thursday s and were normal on Mondays and Fridays. The manager looked at the overall group and could not find an issue, she checked per agent and no single person had a higher than normal rating in the middle of the week. The numbers just seem to increase and migrate around the Fund Transfers agent. (There is much more to this story than what I am stating here.) By reviewing the historical numbers and watching the daily interval numbers on her report the manager was able to learn that the agents in the group rotate the abandoned calls on a daily basis so each day a different agent had an easier day. Problems in the call center can be hidden and the best way to find the problem is to dig deeper and get the details. 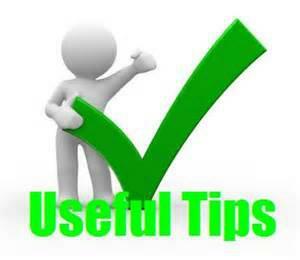 Again the point of this tip is to be clear, concise and find the real details of the problems. Define where you have the most to gain. Or another way to look at this is to define where you have the least to lose. Solving all of the daily problems is not going to happen in today’s contact center business. So rather than trying to solve everything select the problems you would like to minimize and focus only on those problems. Sometimes the problem has been caused by product or services changes within the business and they are directly affecting the contact center. In a retail contact center there was a problem with a product family. The product was unable to meet the expectations set in the on-line and live ads. The product was just not as good as it was claimed to be. The number of calls and emails coming in to cancel the orders and get returns was escalating. Agents were being asked to try and help the customer use the product properly and follow the instructions to the letter. AHT time was very high; service level was quickly dropping, call volumes increasing causing the manager to have to move agents around to the busy groups. Sales and customer satisfaction ratings were dropping for other products and services. Agents were not taking the calls, transferring them or abandoning the calls after they answered them. Senior management made the call to the manufacturer. The manufacturer tried to claim the problem was with the user and they were not willing to buy back the product. The retailer did not want to lose the customers who may come back to buy other products. So senior management made the decision to stop trying to work with the customer and accept the order cancellations and requests for refunds. This was a bold decision but when looking at the sales reports, the call volume had begun to drop, customer satisfaction ratings dropped, and the potential for future revenue did not look good. This seems like an easy problem to solve but when talking about a retailer that has close to a million products and services these problems can appear small. However, the reporting dashboard one of the managers had in place showed the results of not making the right decision. A successful manager will always be thinking about what senior management and the details they will ask for when confronted with a major change. Have reporting that is visible and will alert the right people at the appropriate time. Reports can be seen on dashboards, desktops, wallboards and in several other methods. The purpose behind the multiple methods of report visualization is to ensure the correct audience sees the critical data at the right time. Too often we just assume that a desktop reporting solution will alert the manager to the call center problems. Problems in the contact center do not always follow the manager as she does her walk around management. She may need remote reporting on her smartphone or tablet. Or she may be reading the monitors that are hanging throughout the call center. Part of the solution for reporting is to have a report(s) that are visible to you no matter where you are. Reports that are visible to the agents, supervisors and managers seem like a simple process to complete. However, we must also be aware the data that needs to be on the report and who can see this data. What affect will the data have on the wrong audience or even the targeted agent? These seem like easy questions to answer yet soon after new reports are provided to the agents there is disagreement, productivity degradation, status conflicts and many other problems. Another situation that needs consideration is the type of reporting that you select may not work for everyone. 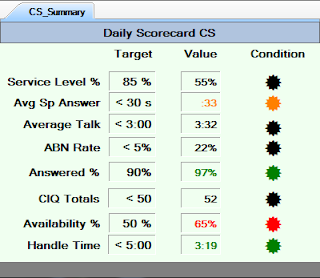 Some contact centers just want to add a wallboard to increase visibility of critical KPI’s. But agents may be heads down, cannot see the boards, work remote, the wrong people walking through the call center can see agent performance information, and other potential conflicts for the call center and agents. Change always occurs in business and the contact center. Problems may follow the direction of the product and services being offered. The time of year may diminish your problems only to have them come back again next year at the same time. Because challenges change your reporting may need to change as well. Your reporting options need to have the flexibility to change and meet your needs. The change may be nothing more than additional work load for the agents. But your reporting still needs to change to understand the impact of the additional work load. By keeping the same old reporting in place with no change to meet the challenges agents will become used to the inefficient reporting. Agents will use the old reports as the justification of not being aware of the problems. Changing the reports as the business changes is a way to keep everyone alert to the business cycles. Consolidate the data from multiple applications into a single report to improve the quick turnaround speed of problem awareness. The average contact center today has over five applications that are running and providing data to the manager. Now consider the critical data from each application; as a manager you will have to click and scroll through each application to find out the status of that particular part of the contact center business. Going through multiple applications and sorting through the details takes time and is only one piece of information. Beneficial reporting consolidates and combines the data into single reports. This collaboration provides the report view busy managers require. Define the problem and determine where the data is located. Once located it can be consolidated and summarized on a single report. You are now able to see the status and performance of the agents and contact center by a glance at the collaborative report. To get to the details of the problem the application reports can be opened when needed and you are able to drill down to the further information that you need. 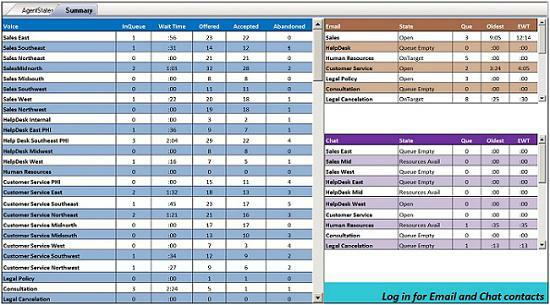 As an example of the consolidation the report shown below is consolidating voice email and chat into one dashboard. The individual applications each have their own reporting which can provide you with the details when you need them. But in the middle of the day when you have a lot happening you no longer need to drill down to each separate application just to see that nothing serious is going on. There are many options to report consolidation. However, the challenges you are facing today should be used to determine what data is combined to a single report. The goals for the contact center can also be used to determine what is to be included on your reports. The report can include the actual and compare it against the goal. The idea is to get agents to hit their numbers and what better way than to do the comparison. By knowing your current status the agents will want to work harder to hit their numbers. This report can also be used to see how well training has worked for the call center, or changes that have been made to the agent’s states or group(s) they are logged into. There are many ways that showing the goal vs actual can help the contact center. A suggestion to solve problems is to target the goals of problem areas. Define the KPI’s within the challenge and include these on the report. Show the comparison between goal and actual. Are the variances changing as agents are made aware of the status / performance? Do the variances change during the day / week / month? Does the business cycle change the variance? There are many questions and showing the goal / actual variance with trends on the report will answer some of the questions. These are some of the best tips that successful call centers are using for their reporting. Please understand that your business and goals is not the same as other industries or businesses. So what others suggest may not work best for you and your agents.